My service has been operating since 1995 under the same ownership, Pet transport of the year 2014 national award. Is BEST to consider your movements for your holiday period and if your time is stretched let us help we can accommodate most situations. We are not affiliated with any one kennel so go to all as required. if you ring us last minute PRE BOOKED WORK IS LOOKED AFTER FIRST. We provide transport in specially fitted out air-conditioned vans. Individual Pet Transport with us your pet has only the best individual service and travel direct to their destination. Pet Courier services our speciality wether its of to the kennels or vets or just across town .dogs, cats, birds, and all small domestic pets, rabbits and small livestock. Specialists in Small animal transport. If it fits in the car its welcome to travel. We are happy to transport pets from all over Sydney, with our main service areas covering the upper and lower North Shore, Eastern Suburbs, Inner West, Hills District, and Northern Beaches also the Central Coast region and Newcastle and Hunter Valley. Separate caging for all pets traveling. Our individual Pet shuttle allows you to schedule a time of pick up or drop off or we can pick up dogs without you home. Cats may need to be picked up from your vet if we can not schedule a time when you are home but a last resort. I am happy to service other areas not listed just give us a call if what you require is not viable I will happily give you some one else based closer that maybe able to help you. You can safely let us be your Pets Chauffeur to the kennel or cattery of your choice across Sydney knowing they will arrive as quickly as traffic allows rather than going all over town before they arrive and settle in. We travel far and wide. We offer an individual quality transfer service for pets to any kennel of your choice through out Sydney and Central coast region we also travel to Newcastle and the Hunter Valley and South as far as Wollongong or Mittagong. Rates vary dependent on distance, tolls and distance from base. All kennels will require seeing your pet’s vaccination papers current for this 12 month period. Usually any vaccinations need to have been done at least 14 days prior to boarding your pet. A Copy should be sent with your pet. Cats are generally are required to have an f3 vaccination, some kennels need you to worm your cat prior to staying. Any vaccination nearly due should be done at least two weeks ahead of kenneling your pet. I need you to organize to send your vaccination documentation to your kennel, or supply me with a copy to take with your pet…otherwise the kennels will reject your pet. Tick protection is a prerequisite for most, if not all, kennels. Please note down the last time you used this sort of protection.Most Kennels require to know the date of your last flea/tick treatment we suggest you have an envelope with these details on or inside for us to take with your pet. You may send a dose of your protection medication with your pet, to be applied at the boarding facility or you can arrange for them to supply the dosage for an extra cost. Tick collars are not suitable, since many kennels allow pets to sleep or play together. The collars are toxic if chewed. Coats should be labeled if sending them. Collars sometimes get lost or destroyed…and some kennels are not in favor of them either…check with your kennel/cattery first. We can take several animals, together, of various sizes and descriptions so the whole pet family is welcome . Deliveries or pick-ups with no-one home are not a problem…But a secure yard is a must. If there are medications or other things to pick up please let us know we don’t snoop . We will not take your leads and for some kennels collars but I usually ask that a lead be left out as some dogs see their own lead as a message that they are going somewhere and it helps with capture. Advance bookings are needed, especially for school holidays and long weekends to avoid disappointment. All special times need prior bookings. We provide a reassuring reliable, safe, professional service to look after your furry friends when you can’t. 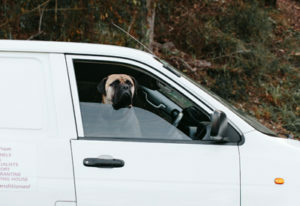 Your pet will come to enjoy the arrival of their Pet Chauffeur. Most of the regulars know how to ask for their treat. Treats are complementary. Our charges cover time wear and tear and tolls (where tolls are required). Pickups or drop offs to interstate Road transporters are most welcome and please enquire about any Pet courier services you and your pet might need.